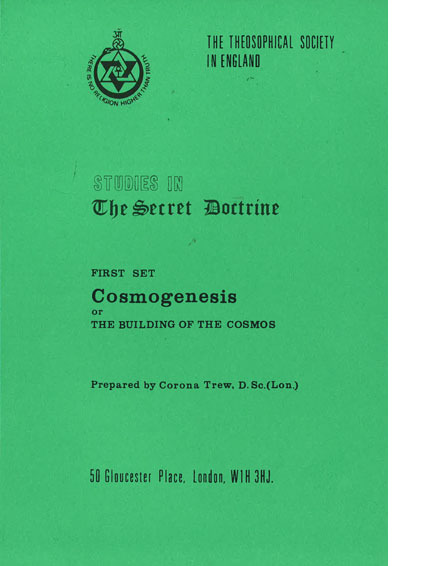 Studies in ‘The Secret Doctrine’: Cosmogenesis or The Building of the Cosmos - Corona TrewThe 1st set of the Stanzas of Dzyan form the basis of the commentaries in volume 1 of ‘The Secret Doctrine’. This set of ten studies covers these outlines of Cosmogenesis, although inevitably some reference is made to the evolution of mankind. Man & the Universe are of one nature, and mankind’s journey reflects cosmic evolution. The 1st set of the Stanzas of Dzyan form the basis of the commentaries in volume 1 of ‘The Secret Doctrine’. This set of ten studies covers these outlines of Cosmogenesis, although inevitably some reference is made to the evolution of mankind. Man & the Universe are of one nature, and mankind’s journey reflects cosmic evolution.